Cancun is an exotic location in terms of both landscape and wildlife, and its name is translated to mean "nest" or "pit of snakes." Over the years, tourism has driven the serpents deeper into the jungles, making it less likely that visitors see them regularly -- although many are still present. Located on the Yucatan Peninsula, Cancun offers a home to nearly 200 different kinds of reptiles and amphibians. Of these, the snakes are one of the largest categories; non-venomous breeds greatly outnumber the poisonous ones. When visiting Cancun, it's important to be mindful of your surroundings, and if a snake is sighted or attacks, remain calm and keep a healthy distance between yourself and the snake. If you're bitten, seek immediate medical attention. All types of coral snakes are venomous, and some can even kill humans. Ranging in size from about 8 inches to 5 feet in length, the deadliest of these snakes can kill a human within 20 minutes if a bite is left untreated. The Mayan coral snake (Micrurus hippocrepis) is one of the smaller types, growing to no more than 2.5 feet in length, but its distinctive color pattern of yellow, black and red stripes makes it easy to spot -- and avoid. Although the boa constrictor may grow to 13 feet in length, it's typically not dangerous to humans. Not venomous, the boa prefers to crush prey to death before eating it. These snakes can survive in many different habitats and will often move easily on the ground near rivers, streams, clearings and farmlands. 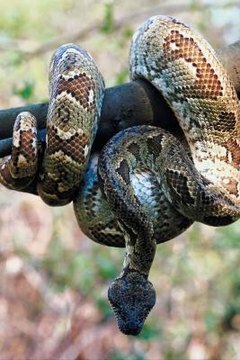 Boas can climb smooth surfaces, making it common to see them on the ground as well as in trees. Their coloration is a brown or tan color with darker brown bands that become redder and edged with cream or black toward the tail, and many have black "spots" the entire length of their bodies. Cancun is home to four different kinds of pit vipers, and all of them are dangerously venomous. Each of these vipers has a "pit" between the eyes and nostrils that allows extrasensory organs to detect and analyze potential prey for the snake. Three of these species -- the hognose pit viper (Porthidium nasutum), slender hognose pit viper (Porthidium ophryomegas) and Yucatan hognose pit viper (Porthidium yucatanicum) -- have similar characteristics such as brown or grey color patterns, an elevated snout tip and a small (up to 30 inches) size. The jumping pit viper (Atropoides nummifer), however, poses less of a danger to humans through venom, even though its attack is sudden and powerful enough to lift the snake off the ground and "launch" it through the air. One of the most beautifully colored snakes to see in Cancun is the green tree snake (Leptophis ahaetulla), also known as the parrot snake. These snakes prefer to live in the forests, curled around a tree branch, but can live anywhere as long as they have a place to camouflage themselves. Brightly colored green scales with a smooth yellow or white belly help to identify this species, which also prefers to suffocate prey (typically frogs) before swallowing them whole. Some green tree snakes may grow to be more than 5 feet long, but they are not venomous.